Bitcoin managed goes in circles around $7,500 handle, market is directionless. The head of BOE speaks about future of digital money. 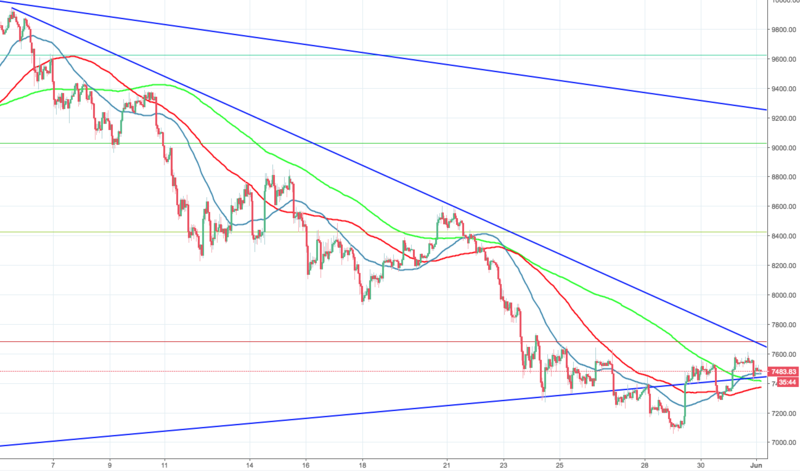 Bitcoin retraced from Thursday's high reached at $7,609 to trade at $7,494 at the time of writing. The price is struggling to regain $7,500 handle amid low-profile and mostly directionless trading activity during Asian hours. The most popular digital currency is unchanged since the start of the day, with the upside potential dying out as long as the price stays below $7,500. Speaking in Stockholm last week, the head of Bank of England Mark Carney dwelled upon the role of central banks in the crypto industry. Carney, known for his distaste for digital currencies as a means of payment, reiterated his interest in blockchain technologies and their transformative role in the future of finance. “Is our role going to be changing the payment systems and helping private providers of digital money, or will we go all the way to a central bank issued digital currency? This is one of the most exciting and important areas. And certainly the most important area to get right,” Carney said in an interview published by the Riksbank on Thursday. On the intraday level, BTC/USD is supported by $7,400, surrounded by a number of technically important levels. Namely, 50-SMA (hourly chart) comes at $7,464, it is followed by 200-SMA at $7.416 and 100-SMA at $7,373. The upside short-term trendline currently at $7,442 offers additional support. On the upside, strong resistance is created by $7,600 and $7,683 (23.6% Fibo).